Use Locate My Computer to get it back! As an online backup service, Backblaze can recover all your backed up data automatically. Backblaze maps your computer's location - updated hourly. Backblaze will report the ISP your computer is using. This helps you or the police determine the location of your laptop. Backblaze reports the network address your computer is using. ISPs know the physical address of their IP addresses. Thief using your computer? Backblaze can show you photos, music, movies, or other files to help identify them. 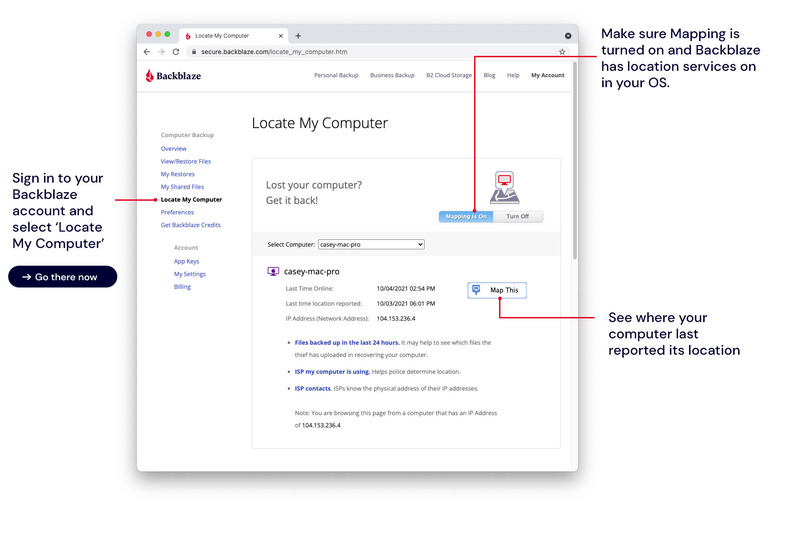 Backblaze provides you the details the police can use to investigate and recover your stolen computer. How can Backblaze recover my data or show me recently backed up files? Backblaze is an online backup service that backs up all your data automatically over the Internet for $x per month with unlimited storage. At any moment you can access or restore any lost files. How does Backblaze know where my computer is located? If your computer uses WiFi, the Backblaze application can see the identifier of the WiFi networks available to the computer. Backblaze then cross-references the WiFi network identifier against a location database. Can Backblaze always map my computer? Where do I see all this information? Simply sign-in to your account and click the Locate My Computer tab on the left. Can I opt-out of having mapping data collected? Yes, you can simply visit the Locate My Computer page and click “Turn Off” at the top of the page. This will turn off collection of WiFi access point data for all computers within your account.